Stonewall’s Blog Tour Schedule & Prize News! Just look at this loot! The Young Reader’s Edition of The Omnivore’s Delimma, Al Capone Shines My Shoes, Dragonbreath and A Season of Gifts by Richard Peck. BONUS: The winner will also get a t-shirt just like the one Stonewall Hinkleman wears on the cover! All you have to do to win is visit at least one Blog Tour site! Here’s the schedule for the blog tour. I’ll add the links as the tour rolls on. Sunday — A little nonsense right here at home. 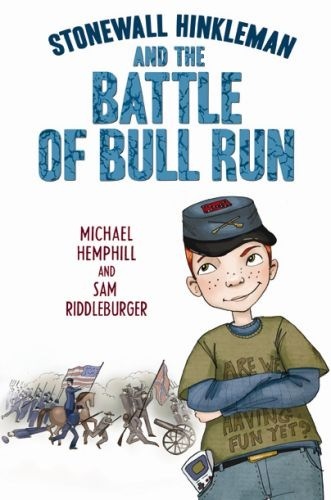 Monday, May 4 – Just Like the Nut takes our book to the real Bull Run Battlefield! Tuesday, May 5 – Collecting Children’s Books takes us to other Civil War battlefields from Kidlit history. Wednesday, May 6 – The in-depth, exclusive Poop Deck Interview! Friday, May 8 – An exclusive interview with Stonewall Hinkleman at Saints and Spinners!